Do you have a gap in your smile where a tooth or several teeth are missing? Are you embarrassed because you have a gap in your smile? Do you avoid going to activities if you think someone will be taking photos? Have you noticed your teeth on one side of your mouth getting worn down to compensate for the teeth that are missing on the other side? Have you noticed you are speaking differently due to having missing teeth in your smile? If the answer is yes to any of these questions, you may want to consider getting a tooth bridge or dental bridges. What is a tooth bridge or dental bridges? A tooth bridge or dental bridges are an apparatus that bridge the gap in your smile. 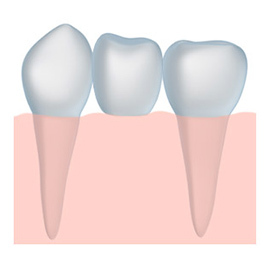 A tooth bridge is connected and secured between dental crowns on each side of the tooth bridge. Dental bridges can give you back your smile, so you can laugh and smile with confidence. A tooth bridge can function just like your original tooth or teeth so you can eat and chew naturally. Dental bridges give your mouth balance again, so no tooth or teeth are being overused and becoming worn down. A tooth bridge can keep the other teeth in your mouth in their proper places so your bite and your smile won’t slip or move. Dental bridges are an effective, rather simple dental procedure. Dental bridges are custom made for you — your dentist will color match them so they don’t stand out and look odd or unreal. A tooth bridge can be completely undetectable, so you can laugh and smile with confidence. You may not want to avoid being in social situations and may not mind when people ask to take your photo. If you have a gap in your smile and think dental bridges may be the solution you want, call today!